MILTON'S SECRET is a nice little film about a boy who is being bullied at school and ignored by his parents. Things change when his grandfather comes to stay with them for a while as grandson and grandfather help each other to be better people. Well made and well acted film is a nice time passer. I'm sure that some people will find something in the various messages about how to live and against bullying, and they are fine, even if they are the same sort of thing that has appeared in any number of similar films. 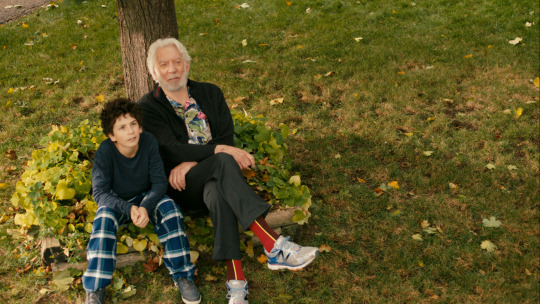 What makes the film stand out is Donald Sutherland's performance as Milton's grandfather.An off center guy who is still reeling from the loss of his wife five years earlier Sutherland creates a character that manages to be rounded enough that he doesn't seem as though he was picked up at the used character store. While Sutherland has been known to walk through some recent performances, here he seems to care with the result is he makes the film something worth seeing. While this is probably not a film you need to see at the multiplex, unless you are a fan of the book it comes from, MILTON'S SECRET is a going to be a good choice to see on VOD on a night when you can't stomach the thought of the latest big budget Hollywood film.